The founding of Trinity came about because of a great social upheaval in Germany in the early 1800’s. Many devout people had become discouraged by the increasingly centralized government and its restrictions on religious freedom. Many felt that the newly formed State Church held little regard for Creed of conviction. Moreover, constant civil unrest made the required military training distasteful to these home-loving people. The first great influx of Germans to the United States after the American Revolution brought about the establishment of Lutheran congregations in New York, Pennsylvania, and North Carolina. Soon there were Lutheran immigrants in Michigan, Missouri, Texas, Louisiana – and here in Memphis, Tennessee. By the 1840’s, German-speaking people figured prominently in Memphis. The German born citizens of Memphis provided a steadying influence to what was then a rough river town of some 12,000 (one third of which were slaves.) They helped elect a German immigrant named William Spickernagle as mayor in 1841. Spickernagle formed a militia to help keep order and enforce the rule of law. In the years to follow, German-Americans started the Memphis Symphony, the Memphis Opera, and became prominent in retailing and manufacturing. In 1839, German Lutherans from the Mid-West meet in Chicago to form a confederation. Its first headquarters was a log cabin in Perry County Missouri and it eventually became known as the Missouri Synod. Its head was an eager young German pastor named C.F.W.Walther. In 1849, the growing organization moved to St. Louis. Walther knew that there were people in Memphis who would like to hear the word of God in German. In 1855, his friend in New Orleans, Rev W. Frick, was coming to St. Louis by riverboat and would be making a stop in Memphis. He asked his good friend to ascertain the situation. Rev. Frick met with the German families of Memphis who, were overwhelmingly supportive of starting a new congregation. Rev. 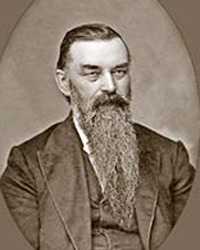 Frick was instrumental in the bringing of John R. Beyer to the city. An undergraduate of the new St. Louis seminary, Missionary Beyer arrived by steamboat on June 22, 1855. He held a communion service for 74 people on June 24, and administered the Sacrament of Baptism to one-month-old George Hach on July 5. He organized the group, preached the Word, set up a school, and helped draw up a constitution. 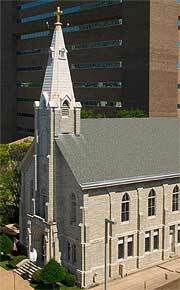 Initial services were held on Sunday afternoons at First Presbyterian Church at Third and Poplar. In a few weeks the group was worshiping in an upstairs room at City Hall, which was then located on North Main in the area of the Memphis Convention Center. Elders were elected by the end of August. Trinity’s first pastor, John Beyer, came to Trinity while still a seminary student. Arriving from St. Louis by riverboat, he immediately started holding worship services and teaching school for the German inhabitants of Memphis. In September the new congregation of 78 families officially called Missionary Beyer as Pastor, and in October the church took on the ponderous name “The German Evangelical Lutheran Trinity Church of the Unaltered Augsburg Confession of the City of Memphis, State of Tennessee,” however, it quickly became known in Memphis simply as the German Church. In the 1874, Trinity finished the first floor of its building, complete with stained glass windows. Work on the second floor would have to wait until after the epidemic. The next year, a more permanent meeting place was secured down the street on North Main, between Market and Winchester (just north of the present Memphis Crown Plaza). This was the congregation’s meeting place throughout the Civil War and the early days of reconstruction. By 1871, the City of Memphis had begun to prosper, as so too, the young congregation. The present day location on Washington Avenue was purchased, and the lower story was finished in 1874. Washington Avenue at that time was “little more than a cow path with hitching posts and cobblestones.” The city extended only as far as Dunlap Street. 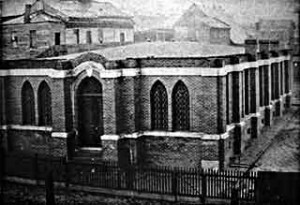 Because the building site was on a high bluff, much of the property had to be dug out by hand and hauled away by mule cart in order to bring the church building close to street level. The upper story was completed in 1878, but because of Yellow Fever outbreaks, it remained unfurnished and unused until 1888.